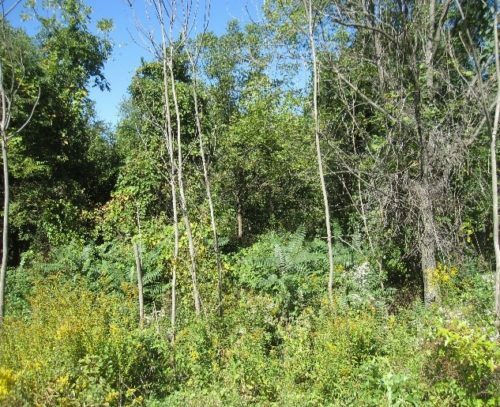 A year and a half ago the upper meadow of a six-acre old field — surrounded by six acres of woodland — had become overgrown with invasive shrubs and trees. Our small group of volunteers, using a Pulaski axe, drawknife, limb saws and weed wrenches, but without herbicides, cut down and uprooted eight large multiflora rose shrubs; cut back and debarked a dozen medium and large autumn olive shrubs; and uprooted numerous seedling trees and saplings. 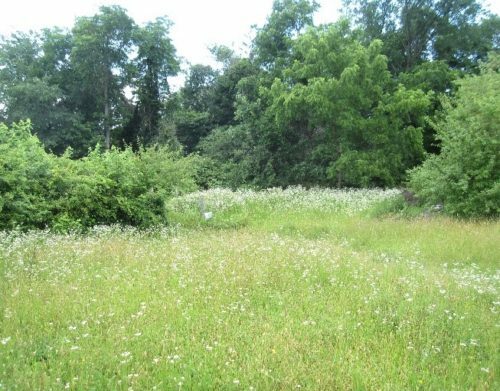 The meadow now consists primarily of cool season pasture grasses and native warm season perennial forbs (wildflowers) that emerged spontaneously from a large seed bank. In the fall, flattop golden top, heath aster and early goldenrod now host a large population of pollinating native bees, wasps, moths and butterflies. 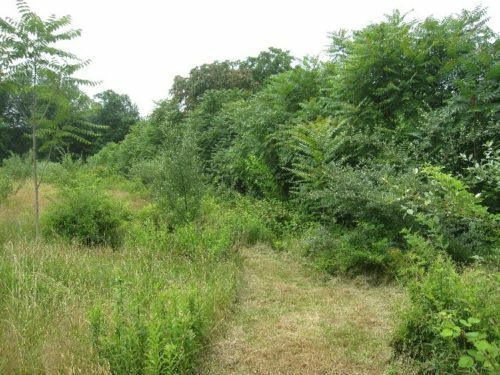 In July 2015, we cleared and cultivated the east side of a double fence line, which separates the upper and lower meadows, over-grown with multiflora rose shrubs covered by porcelain berry and oriental bittersweet vines. 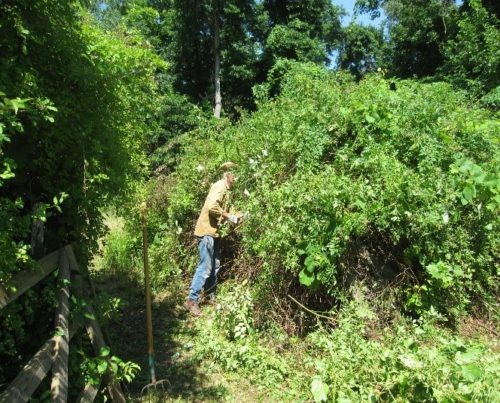 Volunteers cut, uprooted and cleared the fenced area harboring these plants, plus invasive knapweed perennials and Japanese stiltgrass. 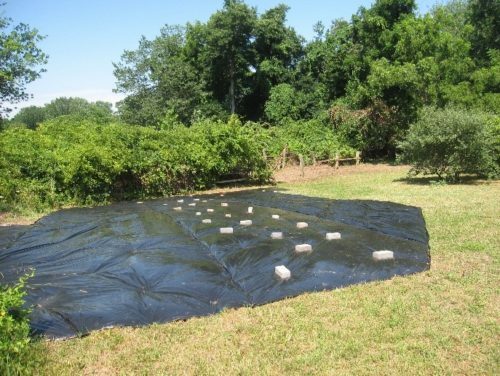 We laid black plastic sheeting in late August 2015 that remained in place up to three months. Then, along with other native warm season forbs, we sowed milkweed seeds, native grasses and a cereal rye cover crop. 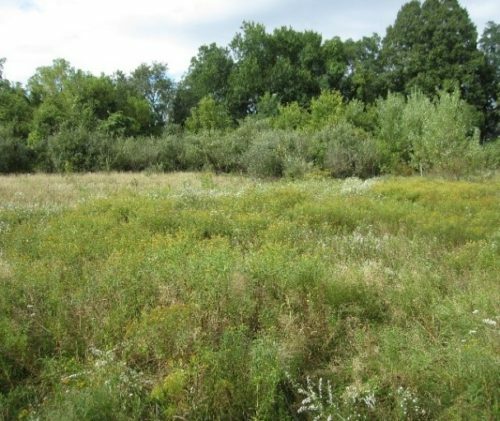 A year later, native heath aster and black-eyed Susan plants appeared. By August 2017 a crop of mixed wildflowers from introduced seed also grew, including the milkweed along with invasive Queen Anne’s lace, which needs to be addressed. 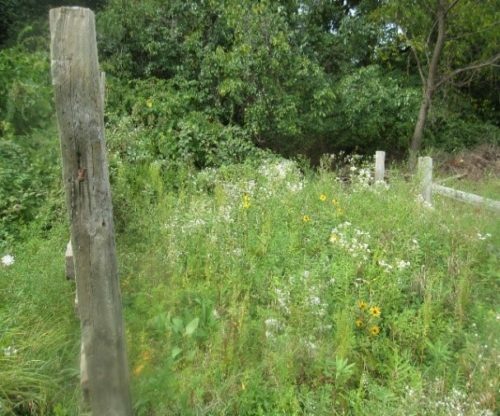 Again in the summer of 2015, we cleared an area of cool season pasture grasses, Japanese honeysuckle, knapweed and poison ivy on the southeast side of the fence. By July we laid and stapled 1,000 square feet of 2 mil black plastic sheeting, which remained in place through November 2015 when we sowed a mix of native warm season grass and forb seeds with a cereal rye cover crop. The first native plants to appear in the summer of 2017 were tall daisy fleabane that sprang from an existing seed bank (Annual fleabane is a native pioneer species that competes directly with many Eurasian weeds. ), along with black-eyed Susan. 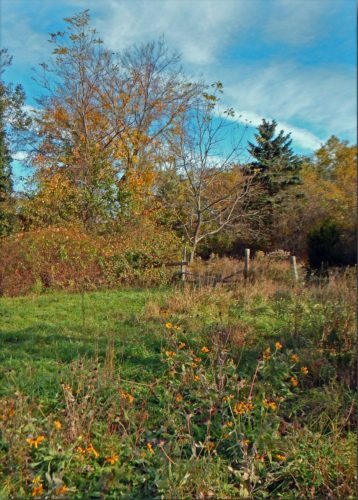 On the opposite side of the fence grew a large maple tree in the upper portion of the lower meadow. 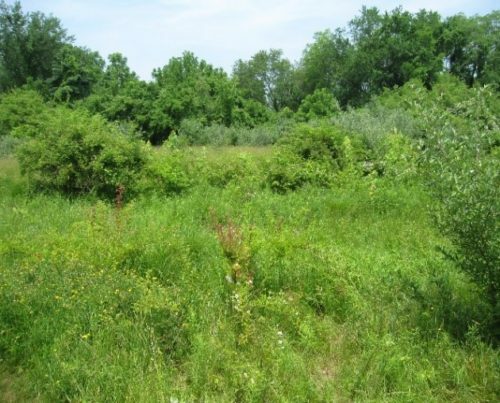 It was overgrown by multiflora rose shrubs and vines, including porcelain berry. 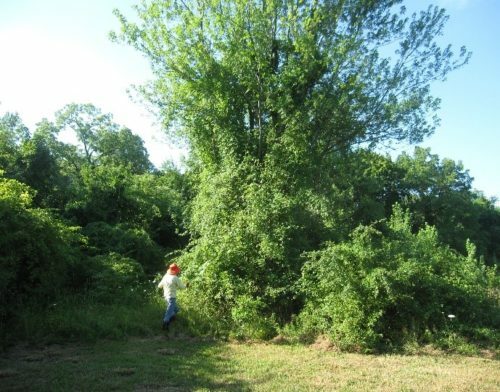 Two years ago volunteers cut, uprooted and removed the invasives that were also spreading into the meadow. Behind the tree we laid plastic sheeting and covered it with corrugated cardboard and the multiflora rose cuttings, which helped smother some of the invasives. 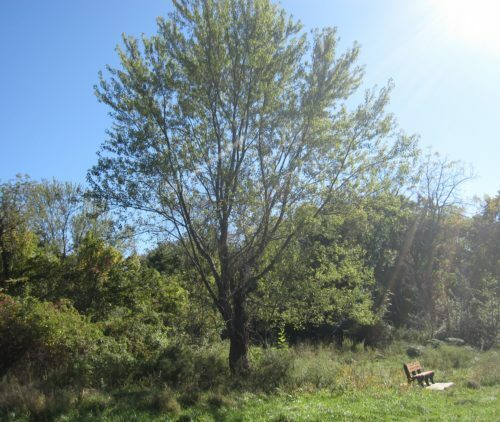 In the shade beneath the maple — harboring a variety of sun and shade-loving native wildflowers — visitors can rest to gaze across the lower meadow on a bench donated by a local Girl Scout troop. Further down the lower meadow in a damp depression on the north side of the trail was a grove of nearly one hundred flourishing but invasive trees-of-heaven, creating a dense canopy where no native plants could grow. We debarked these trees, December 2015. However, our effort to kill them raised questions about our methods. In less than a year, large suckers grew from live roots and in the gaps between the ground and the debarked sections circumventing the trees. Access to these suckers was hindered by large invasive shrubs that grew rapidly in the spring of 2017 due to the open canopy and a very hot and rainy growing season. We researched the optimum season for debarking trees and tested a variety of tools and methods for removing bark down to the ground. This learning experience taught us that the roots are more likely to die when debarking is performed in the spring, and that ripping the bark to the ground should be done with the help of wood chisels. Now, while some assistance comes from the larvae of Ailanthus webworms, which eat leaves of seedlings and small suckers, greatly weakening them, clearing this area of invasive trees and shrubs will remain an ongoing challenge for the future.